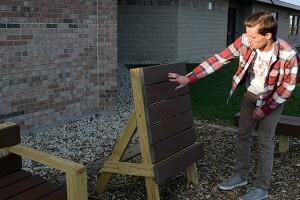 Brady Cairns, a senior at Huntley High School, recently led an effort to construct an outdoor learning garden at Martin Elementary School for his Eagle Scout project. Cairns, who attended Martin for third through fifth grades, said when he was inspired by his memories of the school when considering what to do for his service project. To earn the rank of Eagle Scout, Scouting’s highest rank, a Boy Scout must “plan, develop, and give leadership to others in a service project” to an organization such as a school or religious institution. 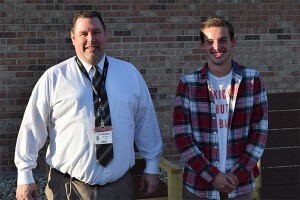 Principal Stotz and Brady Cairns. Cairns discusses the teacher’s easel. After conducting a significant amount of research on similar projects, Cairns approached Martin Principal Jim Stotz with a sketch of the idea. 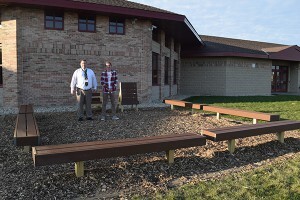 Plans were finalized in conjunction with the superintendent’s office and the operations and maintenance department. The project also received support from 84 Lumber, which donated the materials, and Ed’s Rental, which donated the use of a number of tools needed for the job. Thanks to some unseasonably warm weather, the outdoor space has received a lot of use this fall, Stotz said. Cairns said the work, which involved the help of about 20-30 people each weekend for several weeks, was exhausting but rewarding. “It was a lot of work but also a lot of fun,” he said.